Fear not: I won’t send any of you off the “metaphorical blogosphere road”. Instead, it is my greatest hope that, through the words below, you will gain a better understanding of just how much studying in Ireland can change any given individual, no matter what path of life he or she is on at present. Without further ado, here are my “Top Five Unexpected Reasons to Study in ireland”! 1. Chill out… a ton. I seriously can’t even fathom what my mindset or “sense of the present” would be llike today had I chosen to study in Ireland. I’m going to level with all of you, because even though I may not know you from Adam, I tend to have a compulsive need to tell the truth…especially when I know it can help those around me. I am your classic over-achieving, talkative, go-getting, perfection-seeking, passionate, goal-oriented, dreamer who can’t help but get in my own way sometimes. Okay, more than sometimes. Before I went to Ireland, I found it very hard to chill out, take a breather, relax, however you want to say it. I was in constant motion, which in many ways was good, but in more ways, to put it bluntly, over-kill. When plans I made fell through, or I was a bit behind palnning a paper or project or proposal, I would get angry at myself. I knew intellectually that I needed to find my “inner Zen”, but I had no idea where to start. Then something incredible happened: I accepted a place in the study abroad program at the University of Limerick, and everything started to fall into place…without my incessant planning, I might add. Ireland is a peaceful place. It is a welcoming place. It is a place that allows visitors to look at the world around them and take it all in, instead of only sneaking an occasional glace once in a while. Things aren’t as rushed, people are genuinely happy to talk with others, and life is more about voyage as opposed to the reaching of one’s personal terminus. While studying in Ireland, I changed from someone who lived and breathed planning and deadlines, to someone who uses plans in beneficial ways without letting them control me. Ireland taught me to see life in a different, more beautiful and open, kind of way. That, in itself, is a gem I will always cherish. 2. Gain a better appreciation of history. You may not think about it all that much, but the United States of America is compared to other countries, very much akin to a toddler. At the ripe age of 237 years old (almost 238), we are very young country. While the Republic of Ireland is also fairly young, having gained independence from Great Britain in 1922 the land and culture of the country is r ich enduring and deep-rooted. I mean, seriously there are forts, castles, ancient tombs, breathtaking rock formations and notable landmarks EVERYWHERE. While I was at the University of Limerick, I had two castles (King John’s Castle and Bunratty Castle) within a 20-minute drive from me. The Cliffs of Moher were a 35 to 40 minute drive away. I could get to Dublin to visit the Famine Ship and the Guinness Brewery via the train in two hours. The express bus to Galway City, where I got my lovely claddagh ring from Thomas Dillon’s Claddagh Gold, was a 45 minute ride. Cork and Blarney, both with beautiful sites and a plethora of stories to go along with them, were an hour and 30 minutes away by bus. 3. Look and feel healthier. You know all those really gross additives and artificial flavors and colors that we hear so much about? You know how, despite hearing about all these really gross “items” in our food, we still eat a lot of them anyway, usually because we have no idea they were even in our food in the first place? Good news…Throw high-fructose corn syrup, dangerous artificial products and harmful preservatives out the window, because in Ireland they are ridiculously hard to come by. I’m not saying that they’re completely not-existent, but I can tell you that, in Ireland, you won’t feel the need to read the fine print on every single label just to make sure you’re “eating right”. Between the wonderful farmer’s markets found in the major cities and on the campuses of colleges and universities, to healthier options found in local grocery stores, Ireland boasts a land of genuinely healthy food options. If you’re anything like me, you’ll find yourself feeling healthier. 4. Become a time management champ. I feel as though this reason is semi-obvious. While studying abroad, you’re going to want to explore, go out, travel, get involved on campus, and, you know… study. All of this very achievable as long as you get to grips with the time management, fast. While this life skill is one that isn’t “Ireland specific”, I felt as though I would be doing all of you a huge disservice if I didn’t include it, even briefly. Basically, budgeting time for all of your study abroad endeavors is POSSIBLE in Ireland…and I’m not just saying this as the “pre Ireland me” spoken about in reason #1. I;m saying this because there is no more peaceful, beautiful, safe and welcoming environment than the Emerald Isle, if you’re looking to refine your time management skills, identify your passions and hone in on your strengths. Forced me to embrace change, and the fact that life doesn’t always go as planned. Helped me understand my greatest assets and those pesky weaknesses. Afforded me the independence I so craved since, well, birth. Showed me that making mistakes isn’t a fatal flaw…It’s human and necessary for growth. Allowed me to see clearly for the first time who I was (and am now) and what exactly that meant for my present and future. Showed me just how open my mind could become, and how many wonderful adventures I could fill it with from day to day. Gave me to tools to write my own story, and share it with others. Why study at Institute of Technology Blanchardstown? DkIT students from the Department of Computing and Mathematics recently took part in AIB DataHack, an initiative aimed at 3rd Level computing students to help build the future through the power of IT. The overall prize fund for the competition was €8000. In total, sixty-three teams entered into the Datathon or Hackathon, comprising of 126 students from 13 different Universities and Institutes of Technology, Supported by the DkIT ACM Student Chapter, there was a strong showing from the Institute with five teams participating in the AIB Bankcentre in Dublin. In the Datathon the students were tasked with solving a problem using a large dataset provided, while the Hackathon entrants were asked to build an app, judged by two criteria – Quality and Awesomeness! Jonathan McCrea, host of Futureproof on Newstalk, and Aoibheann Bird from the Insight Centre for Analytics joined the AIB judging panel to assess the entries. Ronan Prenty, a fourth-year student from the Level 8 Computing programme in DkIT, took part in the Hackathon alongside classmate Audreen Soh. Audreen explains, “We were amazed at the setup provided by AIB on the day of the event. The level of competition was extremely high amongst the 126 competitors. Thankfully, the free food, drinks, goodies and spot prizes throughout the long day kept us going, along with the good music and the many games we got to play!” In the Hackathon, the participants were challenged to develop an idea that could enhance society. Ronan details, “Our idea was to bring good to communities within Ireland through crowd funding – we created a cross platform app that worked on any browser and could be installed on any device as an app. People within communities could pitch their ideas of something within the community that required funding and at the end of every month AIB could shortlist these ideas for people within that community to donate/vote on. Each vote would cost the user €2 with the possibility of AIB or other big companies to sponsor votes. Essentially, this would increase AIB’s Corporate Social Responsibility within these communities”. They coined their innovative App, ‘Community Together’ which allowed users to post and vote on causes that needed attention within their communities. In the preliminary round of judging, the contestants were separated into multiple groups of four teams, each team having to pitch their idea and product to developers and staff from AIB. From there, it was narrowed down to seven teams in the finals where Ronan and Audreen pitched their concept to the judging panel. The Dragons Den setting allowed the duo to showcase their creation, and provided the opportunity for the judges to get a hands-on experience of their application. The standard of competition was very high but ‘Community Together’ impressed the judges sufficiently to be placed second overall, with students from NUIM claiming the top honours. Congratulations to Ronan and Audreen, and indeed to all students from the DkIT ACM Student Chapter who represented the Institute so well when taking part in the DataHack. I’m a fourth year Business Management/Arts student and I chose to study only my Arts courses while on exchange. At UCD I studied 6 courses (modules), which is the standard full-time load. Though you have to study more courses, I found the workload to be similar (if not lighter) than my usual workload at UQ. In my experience the grading system at UCD is also slightly more generous. My classes at UCD consisted mainly of lectures, with few tutorials. However, the class sizes were much smaller than those at UQ so it was not difficult to get to know the lecturers and seek their advice on the coursework. I had some trouble signing on to my modules before I arrived in Dublin, and did not get into a few modules I needed as they were full. The staff at the UCD International were a wonderful help in my first week on campus and signed me on to the modules I missed out on. There were many other exchange students who were in the same situation and the staff were able to sign them on to their classes or find alternatives for them. Going on exchange was such a unique and worthwhile experience. I met amazing people from all around the world, and made close friendships with both Irish and International students (including some fellow Australians) who made my exchange even more rewarding. I was able to travel all around Ireland and Northern Ireland throughout semester. I also made it to Scotland, England, Portugal, Denmark and Iceland. I completely fell in love with Ireland, and it didn’t take long for Dublin to feel like home. I lived on campus in the Glenomena residences. In Glenomena you share an apartment with 5 other students, have your own bathroom, and share the kitchen/living room. The apartments are very modern with enough space to live comfortably with 5 other people. The kitchens are equipped with two small fridges, a microwave and a stovetop but no oven. I got by fine without an oven (you may sometimes just have to get a bit creative with your cooking). When it comes to choosing a residence, you can’t really go wrong with any of the main campus residences. It just comes down to your personal preferences for the number of housemates, shared or ensuite bathrooms, catered or non-catered, and the price. They are all a short walk to all the buildings on campus, and the convenience store Centra. I really enjoyed living in Glenomena and would definitely recommend it. There is always security at the gate to the Glenomena/Merville residences at night, and other entrances are locked after a certain time at night. This meant I always felt very safe being in the residences, even though the tight security was at times inconvenient. It’s very easy to socialise while on the residences and there is a great sense of community, which is what I liked the most about living on campus. I was lucky enough that all of my housemates were Irish students, I found that most exchange students I met lived with mostly (or exclusively) other International students. This made it very easy for me to meet other Irish students and get to know Dublin and Ireland through their perspective. Living with other International students gives you the opportunity to really get to know people from all around the world, and you’ll always have someone to go exploring with. It just means you may have to make more of an effort to get to know Irish students, but there are plenty of opportunities to do so through classes, clubs and societies, and living on campus. I found Dublin to be fairly similar to Brisbane in terms of expenses. To live on campus you need to pay the residential fees upfront so there’s no rent or utility bills to worry about. Make sure you have at least a rough budget for everyday expenses, entertainment etc, and travel. Little things like paying to use the laundromat on the residences, and topping up your Leap Card (Go-card equivalent) can add up very quickly so it’s important to keep that in mind. I think the best thing to do is over-budget for most things, as there are always going to be unplanned opportunities, and unexpected expenses that pop up. I took advantage of the OS-Help Loan, and was lucky enough to receive a travel grant for my exchange. Ireland is a great base for traveling around Europe, and it’s very easy to get cheap flights with airlines like Ryanair an Aer Lingus. Keep an eye out for special deals and sales with budget airlines. Ryanair was offering 60 cent return tickets to Copenhagen during one sale while I was on exchange! Going on exchange has made me a far more confident person. You get thrown into the deep end in a way, so you learn how to be more independent and become far more capable of working through unexpected or difficult situations. Being in Dublin city on St Patrick’s Day was absolute madness, and if you are at UCD in UQ’s semester one (their second semester) make sure you are in town that day! The streets become flooded with people in green, and the atmosphere is electric. Take some time to learn about Irish history and culture, whether through your classes or on your own. It will really enrich your experience. Join the ESN (Erasmus Student Network) or ISS (International Student Society) to meet other exchange students, go on day/weekend trips around Ireland and enjoy heaps of social events throughout semester. The International Office books appointments for international students at the Garda National Immigration Bureau to get the necessary GNIB card. I’d recommend going to the office during one of these appointments or getting to the office before it opens to potentially avoid what can sometimes be a more than 6 hour wait. Visit all the tourist spots in the city, and venture out to places like Howth, Dun Laoghaire, Killiney Hill and Bray just outside the city centre. Outside of Dublin my personal favourite places were The Cliffs of Moher, Galway, Blarney Castle, Connemara, and The Giant’s Causeway in Northern Ireland. Watch some live music: The Ruby Sessions at Doyles are great for undiscovered local talent, or Cobblestones if you want to see traditional Irish music sessions. There are also some very talented buskers on Grafton Street! It helps to really do your research early on not only the host uni and courses, but also the city and country you’ll be living in to make the whole process a bit smoother. If you’re interested enough that you’re reading testimonials my advice is definitely follow through by going on exchange. It takes a lot of organising, but it’s easier to participate in UQ Abroad than you might expect, and most definitely worth everything you put into it. Hui Sun is an international student from China earning her MEconSC in International Finance. Some Chinese friends kept asking me how I manage to balance full-time school, part-time job, recreation and extracurricular activities in Ireland when I barely knew anything about how life is like in another continent. 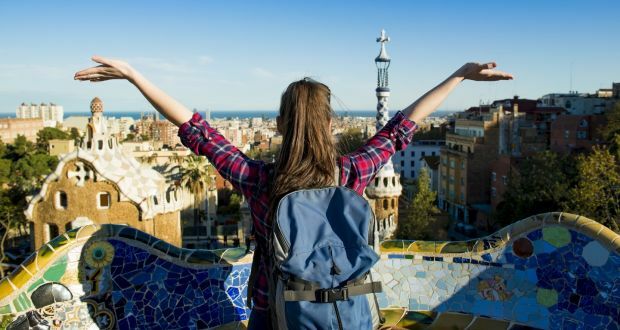 As a foreign student studying abroad for the first time, it goes without saying how important it is to improve our work-life balance in an entirely different environment. If you want my honest answer, there are two very important tools that I’ve integrated into my weekly life that I think each international student should bear in mind: handle your pressure and time management. Step 1: Self-analysis, find your limits, your strengths and weakness, the most effective studying method for yourself and your optimal hours of sleep, etc. Step 2: Stop spend all day in library and enrich your spare time, but narrow down your involvement to the things which could really ignite your enthusiasm. Step 3: Keep a calendar. Stick to it. I followed his suggestions and did a thorough self-analysis. I realized that I am always eager to understand concepts and things from very bare bottom, i.e. from the bare axioms. I liked logical reasoning. In short, I was right on choosing my major. What I truly lack is not mathematic knowledge itself, but enough confidence and patience. So I settle down to study from the very basics, little by little, and luckily, my classmates were always there to help me so I happily aced my first semester’s exam. Also I have decided to push myself to develop healthy habits—to work out and better my physical fitness. This semester, instead of taking everything one step at a time, I decided to take life head-on because, why not? You don’t know your limits until you challenge yourself and I wanted to learn mine. Sure, there are some hard days, but that’s when exercise comes into play. Specifically, tennis and climbing. Actually, I was quite uncertain when I begin to decide whether I should start learning some new sports because I am not used to be a total novice when I enter college clubs. It’s not like the time I attended college table tennis club in China when I have already been trained for years. Fortunately, when I finally set up my mind and stepped into the tennis court and the climbing wall, I found there were quite a few newcomers like me who had no experience and all of us were taught from the very basic. The club managers were very friendly and patient, we all enjoyed ourselves, and I should say doing sports is really a great way to release our pressure form the daily routine. I even passed my NUI Galway climbing certificate after the whole session of climbing class! The third aspects for me to change has been organization, specifically time management. Utilizing my at-home calendar app, Google calendar app, and an on-the-go planner app has helped me tremendously in terms of knowing my weekly assignments and tasks. I believe very strongly in writing things down and setting reminders because that is one of the best ways I retain information and memorize my goals. A good organizational practice to get started is to take everything that you need to do in a week and write them down from greatest to least important and make it your business to set aside time for every goal each day. Before you know it, your entire list will be diminished and you might even have some time to spare for extracurricular activities. These may seems like two very small methods towards self-improvement, however, practice makes perfect and habits turn into muscle memory so even if you don’t see much of a change immediately, taking baby steps towards big goals are still steps in the right direction.